No real context of the events is provided. There needed to be a back story to set the stage, but unfortunately it was non-existent. The only positives are Gabrielle Union did what she could with what she was given and the events happened quickly. 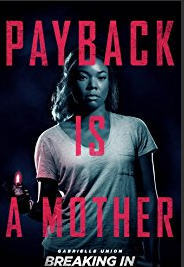 Gabrielle Union will remind you of John McClane (Bruce Willis) from the Die Hard franchise. No Need to waste your money wait for “Breaking In” on Cable.